Imagine being able to fly. Walk through walls. Shape-shift. Breathe underwater. Conjure loved ones-or total strangers-out of thin air. Imagine experiencing your nighttime dreams with the same awareness you possess right now-fully functioning memory, imagination, and self-awareness. Imagine being able to use this power to be more creative, solve problems, and discover a deep sense of well-being. This is lucid dreaming-the ability to know you are dreaming while you are in a dream, and then consciously explore and change the elements of the dream. A Field Guide to Lucid Dreaming shows exactly how to do it. Written by three avid, experienced lucid dreamers, this manual for the dream world takes the reader from step one-learning how to reconnect with his or her dreams- through the myriad possibilities of what can happen once the dreamer is lucid and an accomplished oneironaut (a word that comes from the Greek oneira, meaning dreams, and nautis, meaning sailor). Readers will learn about the powerful REM sleep stage-a window into lucid dreams. Improve dream recall by keeping a journal. The importance of reality checks, such as "The Finger"-during the day, try to pass your finger through your palm; then, when you actually do it successfully, you'll know that you're dreaming. And once you become lucid, how to make the most of it. Every time you dream, you are washing up on the shores of your own inner landscape. 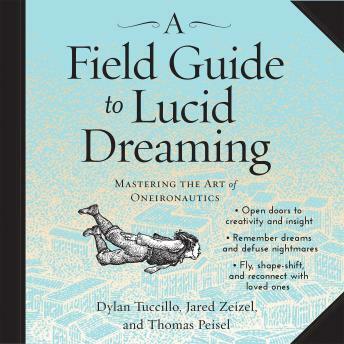 Learn to explore a strange and thrilling world with A Field Guide to Lucid Dreaming. The book has great information and is well organized. The style and humor is childish but does no damage to the content. Very insightful and sometimes humorous. Glad I listened.... hopefully I will be lucid dreaming before long. I am newly inspired and informed for doing so. This is a fantastic book on dreams. First night I had it I listened to it as I fell asleep and it actually triggered a random obe which was a welcome suprise. Full of good advice and things to think about. I wish there were more books/audio books like it. Cheers. If you have never had a lucid dream, you are missing out.